Mitraria has a single species, M. coccinea, which is distributed in cool/temperate rainforests in Chile and adjacent areas of Argentina. 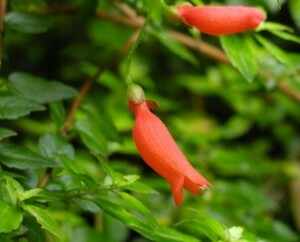 It forms a small, straggling shrub with shiny green leaves and bright red pendant flowers. The species and its selections is widely grown in cool/temperate climates such as parts of the British Isles and in the more temperate parts of the Pacific rain forests of western North America.